Miss Magooz Jewellery: Mixed Metal Beauty! Hello again world! Robin back to shed some light on Meghan's jewellery box and showcase some of the awesome stuff she has been working on over the last little while (and squeeze in a little of my work too! I swear I'll have my own jewellery page sooner or later)! Now unfortunately Meghan was at a Christmas craft show this past weekend and some of the pieces being showcased here may have already been sold, but if you seen anything that you just MUST HAVE and are planning on hitting any upcoming shows, if you send an email to missmagooz@gmail.com, she can put a piece aside, or whip up a custom piece to replace one that has already been claimed! Same goes for any of my work, but you'll need to email me instead at lady.crankypants@gmail.com! Today we're talking mixed metal! In the last few years, partly due to the rising popularity of steampunk, mixing metals together to make fun and unique pieces has become super popular, and makes perfect chic jewelry to accent just about any look! Steamy jewelry has always been one of Meghan's favourite areas to play around with. Mixing found elements, filigree pieces, clock and watch components, and countless little gears creates amazing pieces perfect to accent your favourite steampunk ensemble, or for every day wear! Check out these beauties! The gem of the collection in obviously the amazing gear-and-filigree-butterfly bib which takes most of the lower half of the image, made entirely of metal pieces riveted together for a stunning statement piece. If dainty is more your style, the sweet filigree butterfly necklace might be perfect! 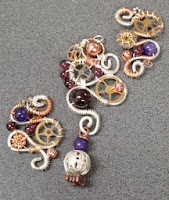 Watch faces, filigree and clock hands come together to make memorable pendants, and can't you just picture that beautiful filigree and chain pendant on the bottom on a nice leather choker? 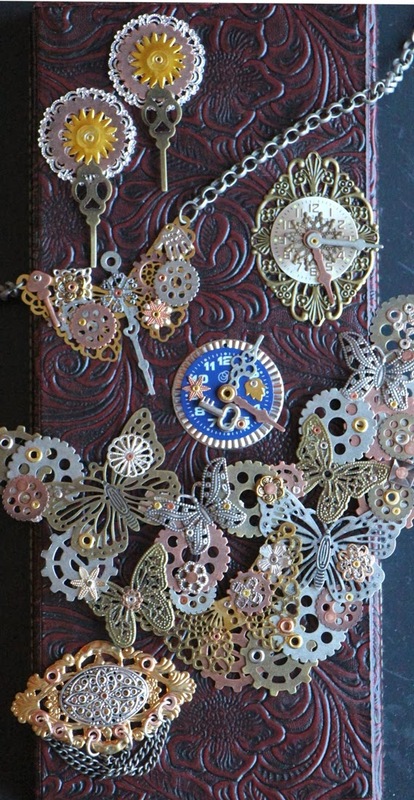 Finally, filigree, gears and watch hands are perfect for a pair of earrings! Speaking of steampunk, we're going to be trying to put together Meghan's first ever steampunk outfit for Ottawa Pop Expo on December 7th and 8th, where you'll be able to find the two of us at our very own table! Stop by to see how it turns out! 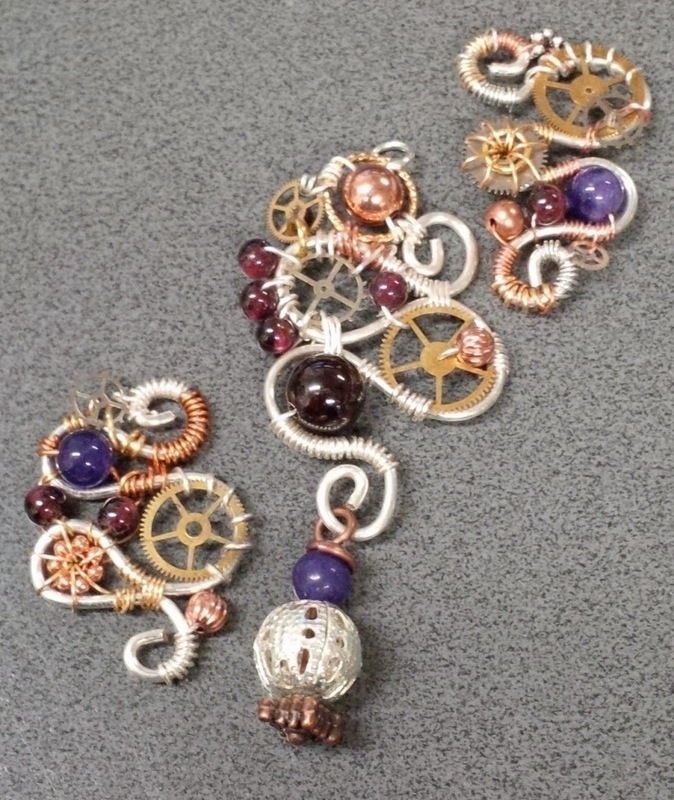 Oh, and Meghan isn't the only one who likes working on steampunk, I've been brushing up on my wire wrapping to work on pretty pieces like this earring and pendant with watch gears, garnet beads, amethyst beads and copper beads! Another exciting addition to Meghan's skill set over the last little while is metal work crafting, hammering, stamping, and playing with metal from sheets and shapes to make fun and funky pieces! Top to bottom, left to right we have a set of awesome umbrella earrings featuring crystals the raindrops, a sweet "free bird" pendant, pretty copper and silver concave circle earrings, some wired copper and silver squares, a pretty dogtag stamped with love, a spoon hammered flat and with a clock face and hands added to make a unique pendant, and a beautiful pendant with waves of different metal coming together to make a sweet and nautical focal piece! The creative possibilities are endless when combining different metals to create fun focal pieces for any outfit! Next time we'll be back to beading with some awesome kumihimo and peyote stitch pieces!